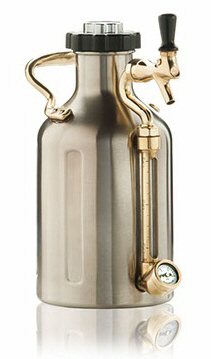 Introducing the all new uKeg 64 pressurizable growler from Growler Werks. Made from double-layer, vacuum-insulated stainless steel, this mini keg will keep your beer fresh and cold anywhere. Fitted with a CO2 regulating cap and tap handle. Includes two 8g CO2 Cartridges, brass handle and integrated pressure gauge.